1. Preheat oven to 375°. Line a large cookie sheet with parchment paper and spray paper with cooking-oil spray (or brush lightly with vegetable oil). Lay 1 sheet filo on paper and brush lightly with a little melted butter. Sprinkle all over with 1 tbsp. parmesan. Repeat layering 5 more times (with filo, butter, and parmesan), pressing each sheet firmly so it sticks to sheet below. Lay the last filo sheet on top, brush with remaining melted butter, and sprinkle on remaining 1 tbsp. parmesan. 2. 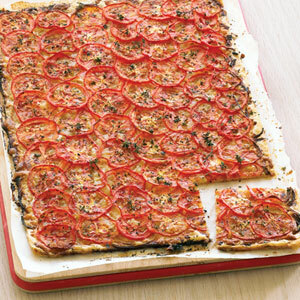 Scatter onion across filo, top with mozzarella, and arrange tomato slices in a single layer, overlapping slightly. Sprinkle with thyme and salt and pepper to taste. 3. Bake until filo is golden brown, 30 to 35 minutes. Cool 10 minutes, then serve.